You can do this with FetchXml and Liquid, and a small hack. Here is a good walkthrough of using FetchXml in Liquid to provide a data service in CRM Portal. I will explain how to adapt this to work for N:N relationships and the hack that would be required. One thing you should understand is that when you create an N:N relationship in CRM, a “Relationship Entity” is also created behind the scene. This relationship entity is the “joining” entity that you would typically find in a normalised database. You can specify the name of this relationship entity when creating the N:N relationship in CRM as shown below. To query an N:N relationship in CRM Portal, we will use FetchXml/Liquid to query this relationship entity instead of the actual entities on either end of the relationship. If you use this FetchXml in Liquid as described by the link earlier on in the post however, you will not get any result. This is because FetchXml in Liquid (as of v8) uses Entity Permission. You need to grant Entity Permission for the relationship entity. (I would guess that Entity Permission for Degree and Subject would also be required – although I have not tested it without). Create an Entity Permission for a random entity. Set the Scope to Global and grant it the Read privilege. Add appropriate Web Roles to it. 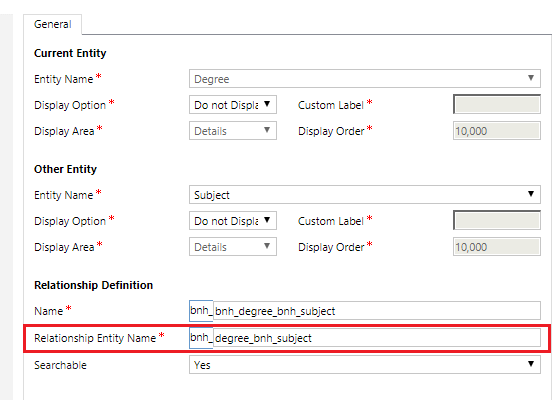 Create a workflow to update the field adx_entitylogicalname of this Entity Permission record to the name of the relationship entity (bnh_degree_bnh_subject in this example). That’s it! Your FetchXml/Liquid should now return results! Is it likely to stop working in future updates to CRM and CRM Portal? I’d say no, but you need to make your own judgement. Thanks Bernado. It worked like a charm on dynamics 365 online v9.0. You saved my day.